The Happyland Park Company was established May 1, 1906 with Herbert Anderson as the president and W.O. Edmunds, the manager. 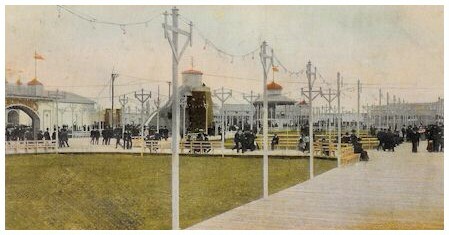 For a cost of $150,000 an amusement area was built on about 13 hectares (5 ha from another source) of farmland between Aubrey and Dominion streets. (The two land-size figures may be the difference between the property size and actual area occupied by Happyland.) Its other boundaries were Portage Avenue in the north and The Assiniboine River to the south. Today, this is an area called "Wolseley". The new park was managed by Thomas Morris who also did the same for River Park and Elm Park. This is most curious because the three parks competed with one another. One would think a conflict of interest would have arisen. Happyland's main boundary fronted 90 metres of Portage Avenue's south side. 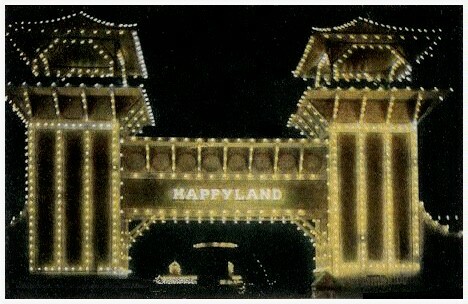 A high wooden fence sported the word "Happyland" and advertisements detailing the amusements to be found inside. Three weeks after the company was formed, the park opened on Wednesday, May 23rd (May 24th, from another source). An estimated crowd of 40,000+ (27,000 from another source) attended on opening day bolstered by the running of new streetcar lines up to the park's entrance. Buildings were able to be constructed quickly because they were wooden frames covered in canvas. This is taken at a later time from the above. Note vehicles of the era parked to the left of the entrance and horses "parked" to the right. A Circle Swing tower may be seen inside and to the left of the entrance. To its right might be white smoke or a stain on the old photo. If it's smoke, it could be from a generator that might power some of the rides and/or attractions. To that end, it does appear that there might be dual stacks under that white blotch. from one attraction to another. 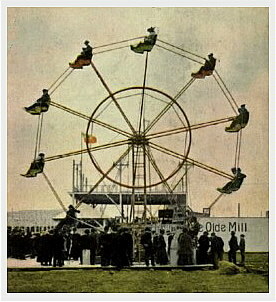 The big ride at Happyland was a "Figure 8" built by Fred Ingersoll and John Miller. The name on the ride was simply "Roller Coaster" although it was termed in newspaper accounts as "Figure 8". It was not ready opening day but did open later that season, as did an "Aerial Swing" (Traver "Circle Swing"). This is a long shot of the roller coaster. Note the electric lights strung from the foreground toward the ride. Also, note the Canadian Ensign flags of the era. The small building to the left is unidentified. A closer shot affords a look at the ride's entrance. The lift hill is seen at the right. Unlike a lot of Figure 8 rides of the era, there is no cupola at the top of it. Other rides and attractions included the already-mentioned "Aerial Swing", two carousels, "Slip the Slip" (a slide? ), "Myth City", "Tour of California", "Chateau Alphonse", a 1000-seat "Scenetorium", "Whirlpool" (a wet, dark ride), "Ye Olde Mill" (same ride as The "Whirlpool" ? 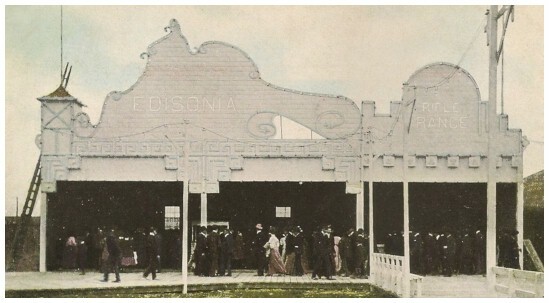 ), "Edisonia" (an exhibition of Thomas Edison inventions), an open-sided, 750 square metre ballroom, a bandstand, rifle range, a miniature railway, and a ferris wheel. The latter appears to be an Eli Bridge 20-passenger model. Note the workman's ladder at the far left. Carnival owner Edward Casey's grandson is Mike Adams of Halifax, Nova Scotia. Mike contributed that Edward worked at Happyland as a child. Ed comments about The "Mill": "Boats would travel through dark places with lights coming on showing flowers, etc. This really was a `Lovers Delight Ride'." This photo shows the dark ride's front along with park benches close by. Edward Casey continues: "The main attraction at Happyland Park was the baseball games. Winnipeg had The `Maroons' and they would play American teams from Duluth, Grand Forks, Fargo etc. in the park's stadium. I had the job of Water Boy and Bat Boy." Other research shows that the first game was held on May 24th of the park's opening 1906 season. Attended by 4,000 fans, it saw the home team lose 5 to 7 to the visiting Duluth players. Edward: "Then there was a Miniature Train, owned and operated by Ernie Burrows, who worked for me in show business in later years, and whose little train was bought by me. They had a Side Show called `The Great Johnstown Flood' and also a `Penny Arcade'." That train ran on 300-millimetre gauge track. As mentioned, Ed Casey later bought Happyland's train after he started his carnival business. He also opened Rendezvous Park in 1950 at Lockport, Manitoba, and of course toured with portable rides as "Casey Shows". This appears to be an Eli Bridge wheel. Note behind it is the performance platform and the "Ye Olde Mill" building. 1907 saw a storm damage the park's canvas & wood structures. This resulted in a circus elephant and lion escaping, all on August 10th. Presumably, this means that a circus or at least part of one had been contracted for Happyland. 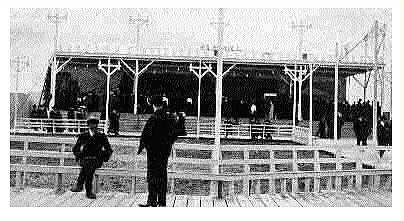 The height of the platform in the above photo suggests circus acts and the photo below does show an acrobat performing. At Top Left may be seen an acrobat in a rectangular apparatus. To the left of that in the background is the Ferris Wheel. Top Center are the park's entrance gates. 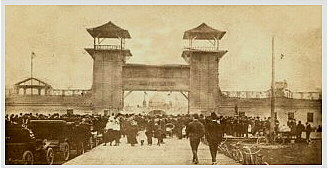 On August 20 1908, just over two years after its opening, the park went bankrupt and was sold for only $6000. No reason has surfaced at this time for the loss of patronship. Regardless, Happyland still seemed viable but the new owners did not run the business well, so the park became run down. 1909 saw a beer garden opened as a way to entice more patrons, but few came. 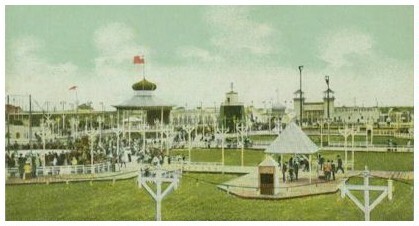 W.M.Fisher, who was Happyland's new owner, tried various schemes which failed to attract the crowds needed for the park to be solvent. It deteriorated further. 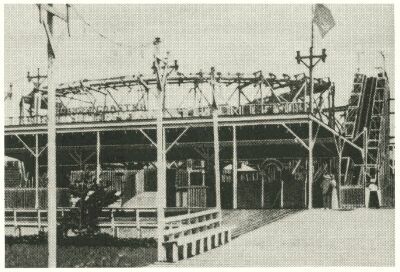 In 1910 the rides at the park were offered for sale. An ad from the Fort Garry Lumber Company mentions the "Aerial Swing", roller coaster, carousel, and the "Olde Mill", plus office and restaurant furniture, and many odds and ends. At a minimum, the coaster was sold. 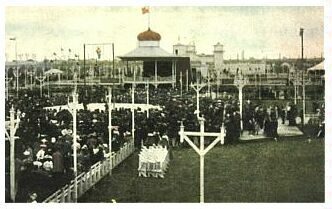 It was moved to the grounds of The Winnipeg Industrial Exhibition for the 1911 season. Over the next decade, fading paint on the entrance fence reflected the sad times the park was having. Likely competition from Winnipeg Beach and River Park was exacting its toll, plus the 1914 outbreak of war in Europe did not help. Fisher asked the City of Winnipeg to open two new streets and subdivide the property, but because of Canada's involvement in the European war, all such proposals were being denied. Only in 1922 did the City finally bring two new streets (Sherburn and Garfield) into existence. These were parallel to Dominion & Aubrey, and located between the two, thus dividing the former Happyland Park into thirds. An exact year for the park's demise is not yet known, but probably it's sometime between 1910 and the early 1920s with a date of 1922 being the most likely, as of the latest research. However, it appears that most, or all, of the rides were removed long before that. George McLachlan of Winnipeg has submitted some information. He quotes the book "Rising to the Occasion", a neighbourhood history published in 2000. It says Happyland was sold in 1908 and closed permanently in 1909. It goes on to say that the area was not developed until 1922 but it also notes that in 1922 residents of the Happyland part Garfield Street petitioned the City to change its name to Happyland Place to eliminate confusion with the older north of Portage section of Garfield. George says: "That suggests some development in 1921 or earlier, which agrees with the City property database that shows some houses on Sherburn and Garfield (South) as being built in 1921." Given that there are photos of the park taken after 1909, this means the book's research is incorrect on a closing year of 1909, unless the photo dates are wrong. It does jibe with the previous information regarding the years of residential build-up, though. Nothing is known between that decade and the present, but George McLachlan, again quoting "Rising to the Occasion", says some of the property was used for tennis courts from before WW1 until the area was built up. Today, the land appears to be a residential neighbourhood. There exists a "Happyland" day-use park with a pool. However, this park is well east of the Happyland Amusement Park of old. It is across The Red River at the corner of Dufresne Avenue and Marion Street near the St.Boniface Golf Course. It is not related to the amusement park of the same name. A large appreciation goes to Vere Scott of Winnipeg, Manitoba for providing major, initial information on this park. 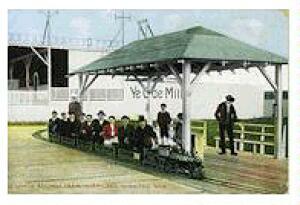 Thanks to Wendy Tapping of Winnipeg, Manitoba for the postcard and photo scans. 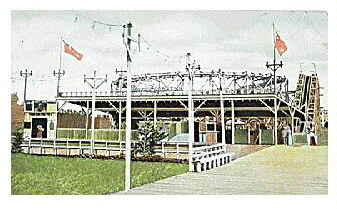 Thanks to Rob McInnes of Winnipeg for his submissions of postcard scans showing the boardwalks and attractions.